We are within days of the anniversary of the first revelations from Edward Snowden’s archive of NSA documents. 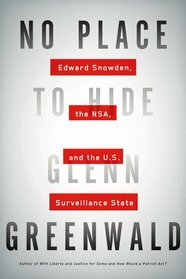 The drum beat of new stories emerging from this trove continues even to this moment.1 So, Glenn Greenwald’s book, No Place To Hide: Edward Snowden, the NSA, and the US Surveillance State might be greeted with a yawn, what could be new? The second half (really it is 170 pages) is a well organized exploration of what has been revealed so far of the NSA’s goals and programs. It is chilling to understand that the internal ethos of the NSA is summed up by the phrase “collect it all” where “it” is all of the information flows in the telephone and internet in the world. As expressed in the presentation slide “New Collection Posture” from 2010, this is implemented through six strategies: “Sniff It All”, “Know It All”, “Collect It All”, “Process It All, “Exploit It All, and “Partner It All”. Even if you have been following the revelations as published in the various news sources favored with direct access to the Snowden documents, it was hard to envision quite how comprehensive the vision of the NSA is. 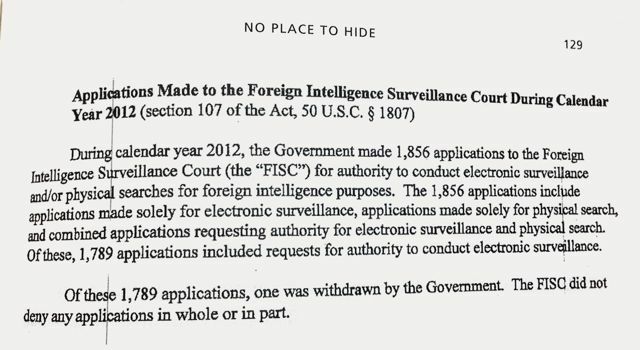 Greenwald reiterates the well-known fact that so-called court, the Foreign Intelligence Surveillance Court, set up by congress to oversee activities of the NSA, FBI and others engaged in intercepting communications is not even an effective administrative element. 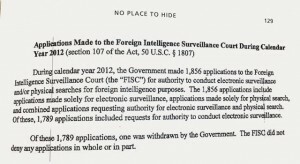 He notes that in 2012 the “court” did not deny a single on of the 1789 applications. As i have argued earlier3 this so-called court lacks most of the important features that our tradition requires of a court – openness, representation of the plaintiff by a lawyer, and ability to confront accusers. The FISC is just a bunch of bureaucrats dressed up as judges. Another issue that Greenwald deals with is the claim by the government and its apologists in the media and academia that the collection of meta data is not really an intrusion on privacy – the NSA is not collecting the content of the communications. (( earlier I have twice commented on this issue: “NSA Vacuuming, Meta Data, Mistaken Misleading Metaphors” and “The Uses of Metadata – an experiment you can conduct with your own life’s metadata“)) In a very telling note Greenwald repeats other privacy activists challenge to those claiming that meta data is benign that they release the meta data for all of their phone calls, emails, and other electronic communications. None have thus far taken up this challenge. Greenwald touches on many other topics: the role of corporations, surveillance of US allies, many NSA software tools to exploit their data warehouses, privacy in human identity, and more. In closing, Greenwald’s book is an excellent overview of the issues presented to date by the work done to understand the Snowden documents. And, it is actually a great read with its detective/spy thriller opening that engages the reader so effectively in the drama of the early days of the Snowden whistle blowing.